Rave Reviews! See what people are saying . 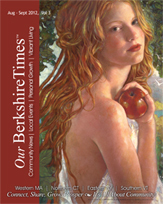 . .
​​​"The cover art, alone of Our BerkshireTimes magazine draws me in; its thoughtful, healthful, and uplifting articles keep me there. This resourceful magazine promotes the best in our creative community." The copy [for my article] is perfect! You are a terrific editor. Thanks so much for all the care you put into your work; it shows and it’s a pleasure to work with you. I look forward to more! Dear Editors and Staff! Hats off to you and your amazing publication! I happened to pick up a copy at a restaurant somewhere in Mass. after the Divine Mercy Conference, and just took my time going page by page. I rarely (never) write to congratulate; but nicely done!!!! I love the writing, the snippets of info, the classy focus on selected topics; and especially the design. Very smart, colorful, sophisticated, clean, and very clever with the use of dropping in meaningful nature scenes throughout. The publication is a delight. Easy on the eyes, compelling, charming, as well as informative. Thank you! Thanks for reminding me of this excellent service [www.OurBerkshireCalendar.com]. I just posted my workshop! OurBerkshireGreen seems to be booming: Hooray! Just the sort of thing we need in this beleaguered world. All best to all of you. 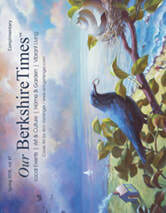 Dear Ms. Regan, I have thoroughly enjoyed the premiere issue of Our BerkshireGreen magazine. I was surprised to see it in print, as I (mistakenly) believed it would only be an 'online' magazine. Thank you very much--wonderful magazine! Just wanted to say thank you! I am new to the area and this job and have been looking for ways to promote HVA's events. Entering and submitting events was an absolute breeze. Great to be able to edit, too. THANK YOU! Our Berkshire Green has brought a thoughtful and conscientious new voice to the community. Your publication looks great and provides terrific information through traditional and modern media. Keep up the great work! I started off as a regular attendee at Our Berkshire Green's monthly networking events. That quickly led to my becoming an OBG contributor, advertiser, and partner. OBG's logo is prominently displayed on the website of my radio show, Well Talk, and mine has pride of place on theirs. OBG Founder and Publisher, Kathy Regan, has also been a guest on my show, while I have gone from networking event attendee to featured speaker. I challenge you to find a holistic magazine of any size that brings together a more diverse range of topics between its covers than this one, or a broader range of speakers and practitioners than the ones who come to their always top-notch networking events, where the information you glean is often as nourishing and fantastic as the food. I feel very proud to be a partner with Our Berkshire Green in spreading the gospel of health, fitness & wellness to as broad an audience as possible, and look forward to helping each other do that for many years to come. 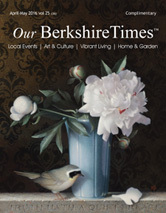 BerkshireGreen [now Our BerkshireTimes Magazine] and all of you I have met are truly an asset to our great community as we all take care of the little peace. What fun it has been to feel so fully apart of this new creative venture, OBG. In every way you, your team, and of course Kathy have labored to showcase my, my skills and talents in the best possible light. I have enjoyed the clinical referrals OBG has generated, and look forward to the educational opportunities that this publication offers as it enters it's second year. 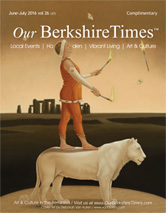 Thank you for offering this wonderful resource [www.OurBerkshireCalendar.com] to the community. It is good to be connected to such a good organization. Through Our BerkshireGreen I have been able to connect with good people all throughout Western MA , and have been able to expand my business coverage considerably. 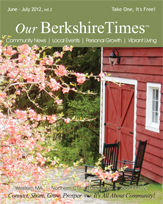 Our BerkshireGreen [now Our BerkshireTimes Magazine] is creating a community of like-minded individuals where we, as business owners, can share ideas . . . network . . . and contribute to this great area in which we live. THANK YOU for the calendar. It is a great community service! I advertised our electroBlast water boosters in several issues and mentioned Berkshire Bike and Board and Guido's Fresh Marketplace as the local outlets. Folks must have been real thirsty because both places sold out and recently reordered. This was a great way to support the magazine and in turn make some sales. 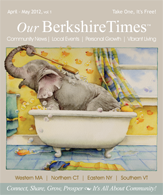 [Our] BerkshireGreen [now Our BerkshireTimes Magazine] is a resource I use to reach others in my region with similar interests and approaches to health and like. It's like being in the dark without it. It is easy to maintain a holistic lifestyle when I have Our Berkshire Green for all my resources.